Opened in March, 1983, Market Street Station, designed by Johnson Hopson & Partners, consisted of two levels. Above ground was a bustling plaza where riders could hop on a MallRide shuttle or await their bus transfers in the shade of ash, oak, and locust trees. Downtown residents and employees lined up for lunch at the corner hot dog cart, and skateboarders practiced grinds on the plaza’s round stone benches. A sleek glass enclosure sheltered the escalators that took riders below ground, where they could find the ticket office, bus schedule timetables, and eleven bays for regional routes like the B to Boulder. The two-level design of Market Street Station was an economical way to fit several routes into a single city block. However, Denver’s transit needs soon outgrew the not-quite forty thousand-square-foot station. The 16th Street Mall was extended to Wynkoop Street in 2001 and connected with the newly-built Millenium Bridge in 2002. After the approval of FasTracks in 2004, RTD set its sights on revitalizing Union Station a few blocks away as Denver’s transit hub, which only became more urgent as Denver’s population boomed. Market Street Station closed in May, 2014 after 31 years of service, although RTD kept Market Street Station's neighbor - 1660 Blake Street - as its headquarters. In 2015, Denver-based developer Continuum Partners purchased the two acres surrounding 1660 Blake Street for $11 million, which helped fund the redevelopment of Union Station. Slated to open in February of 2020 as simply Market Station, the transit-oriented development will feature a mix of residential, office, retail and restaurant space, accessible via a pedestrian-friendly “paseo” between 16th and 17th Streets and Blake and Market. We’re confident this new incarnation will be an even more vibrant and welcoming gathering place for the people of downtown Denver. Want to see more photos of Market Street Station? Check out our post from 3/15/19 on Instagram. Find more RTD history over the last 50 years at www.rtd-denver.com/50th.shtml - including some elephant-sized grand opening festivities for Market Street Station in 1983. 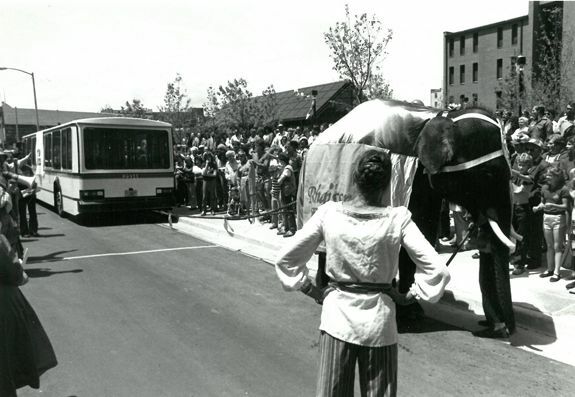 Stoney the Elephant challenges a 16th Street Mall shuttle bus to a tug-of-war challenge during the grand opening celebrations for Market Street Station, June 6, 1983.